USTA Events: USTA League teams, Scottsdale Athletic Club Junior Open. Men's 35 National Hard Court Championships, Fiesta Bowl Senior Open. This family-owned and operated facility has been a Scottsdale tennis institution since 1971, when it swung open its doors as the friends and tennis acquaintaces of Robert Hing, a lawyer and an avid tennis player. 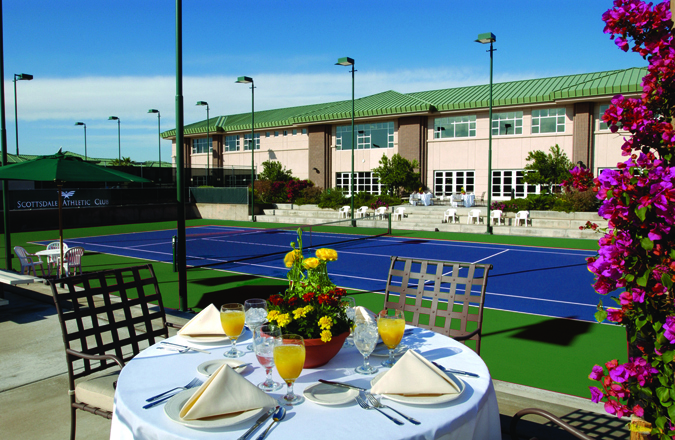 With 11 championship tennis courts and an 85-room hotel, the facility offers a supreme tennis experience. The Scottsdale Resort and Athletic Club (which is still owned by the Hing family) is home to USTA leagues, several charity events, junior tournaments, and two long-running and top-level national tournaments annually, the Men's 35 National Hard Championships in April and the Fiesta Bowl Senior tournament each December. The facility has also been a host site for other USTA functions like coaching workshops, and this March's charity fund-raising event 'Tennis With a Cause' which benefits USTA Central Arizona scholarship programs for Phoenix-area youth. The Scottsdale Athletic Club is also the home location to The Player's Academy-Scottsdale, one of the top training locations for juniors in the Southwest. Thank to the Scottsdale Resort and Athletic Club for their support of USTA programming!